CHICAGO, Aug. 25,- Gone tho he is, the fabled old-time side show talker left the modern carnival midway a descendant whose words are colorful actions will survive today's mechanical age. For. however, nostalgic their yearning for the old-timer himself, America's top carnival owners agree that his offspring is still more adept at turning a tip than any mechanical substitute yet devised. Queried specifically recorded voice transcriptions to bally shows, a wartime measure employed by some carnival, most midway operators the practice is, in their opinion, not likely to put the spielers out of business. "Your milling midway crowds want to see the talker in action," asserts Peter Kortes, manager of the North American Exposition Shows, summing up the majority viewpoint. "It takes a real, live talker to gather a tip, then hold and sell it with his tricks or the trade." "Records are being used now, due to manpower shortage," explains John H. Marks, owner and manager of the Marks Shows, well-known Eastern carnival organization. "Many of our best talkers are in the armed forces and managers would rather rely on canned openings than inexperienced talkers." But Marks voices the belief of most managers in predicting that "transcriptions will pass out of the picture with the discharge of our men in the service." Few, if any, of the nation's showmen view the synthetic spieler as a serious threat to the so-called "barker," a legendary figure as American as apple pie, and a favorite of fiction, stage and screen. But his lesser known comrade of the lots, the grinder of the small shows, faces opposition that should alarm him, in the belief of many, including Roy E. Ludington, of Crafts 29 Big Shows, Pacific Coast organization. "To old-time showmen," says Ludington, "nothing will ever replace those bygone orators whose silver tongues and pulpit gestures held crowds spellbound. But Crafts Shows is now using transcriptions on three grind shows and one Funhouse and the operators report they would not be without these mechanical grinders." Ludington points out that recorded voices on grind shows not only eliminate novice ticket sellers, but are constantly dependable, always in "good voice" and censored for correct and proper lingo. But he doubts that platters will ever be widely used in front of bally shows. John W. Wilson, co-owner with Issy Cetlin, of the Cetlin & Wilson Shows, also marking the distinction between grinders and bally talkers, points to radio to support his contention that talkers must be seen as well as heard. "Why." he asked, "would the radio industry spend millions perfecting television except for the certainty that their patrons want to see as well as hear the programs?" Wilson, in a careful and detailed analysis of the subject, concludes that a real talker, adept at catching the whims of his listeners and quick to seize opportunities, will survive the threat of mechanical gadgets. Supporting the minority opinion, such leading showmen as Max Goodman World's Wonder Shows impresario, argue that voice records will solve many bally problems. "Sure," says Goodman, "crowds prefer a talker who is a good salesman, but in late years they are few and far between. The old ones are going and no new ones are being developed." Goodman's statement is echoed by Ernest Sylvester, secretary of the Regal Exposition Shows, now touring Tennessee fairs. "There are very few Duke Drukenbrods on fronts as presents," asserts Sylvester, "so I am using recordings made by professional announcers from radio stations." While not yet employing platters himself, Goodman is enthusiastic about them after observations made on a visit to the Conklin Frolicland at the Regina (Sask.) Exhibition. "Patty has them in front of several grind shows, and believe me." he says, "that is the money. I am for them for small shows and if the new wire recording system is as practical a they claim, records will solve many a bally." Frank Conklin, vice-president of the Conklin Shows, grounded in the tradition of leather-lunged talkers, admits that he finds it hard to get used to the new trend. "It was bad enough when the lads turned to the microphones, but if they're going to leave carnivals altogether, the life won't have much color left to it," he says. This theme is expanded in reports from others, including M. G. Dodson, manager of Dodson's World's Fair Shows, who recalls when he was considered a first0calls talker himself. "Most anyone you put in front of a show today thinks himself a talker," but asserts Dodson, "take the p.-a. away from him and he would be speechless." Many showmen most vehement in defense of real talkers concede the value of transcriptions for special purposes. 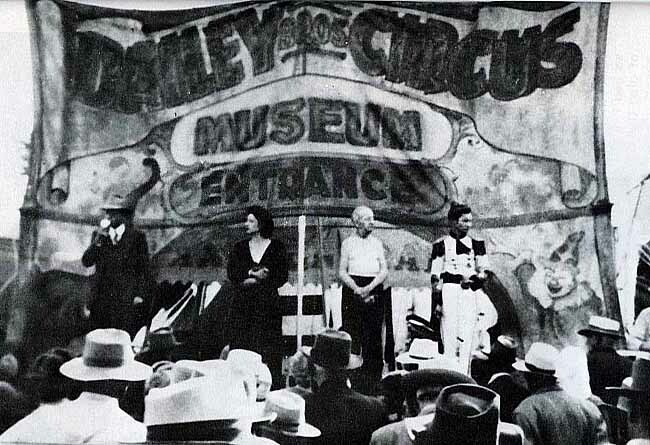 Dodson, for example, points to the use of a "laughing record" in front of the Funhouse operated by Charles Goss on the Dodson Shows as an effective piece of mechanical salesmanship. Carl J. Sedlmayr, general manager of the Royal American Shows, is another who has found transcriptions valuable under certain conditions. "When Zorima was over here five years ago." he relates, "we played a record for the inside lecture. This worked out satisfactorily, because the show was presented in semi-darkness, and the lecturer was not supposed to be seen." Sedimayr believes the first record ever used in front of a show was cut by Jack Dadswell, Royal American press representative, who transcribed Raynell's regular opening with a machine carried in his press wagon. "When the crowd was small," says Sedlmayr, "Raynell would use the record, holding the mike close to her face and barely moving her lips, but saving her voice for larger crowds." Another record effectively employed on the Royal American Shows was that cut for Mrs. Dodson who, confronted with extreme manpower worries, handled both the inside of her Monkey Show and the grinding in front by use of the transcription. General Manager F. E. Gooding, of the Gooding Amusement Company, can see some point in employing records to follow up a talker but believes the public prefers to see the talker in action for at least the main openings. "It is the same principle as an orator or a band," he adds. "It is always better to see them than to hear them over the radio." Jack Ruback, general manager of the Alamo Exposition Shows, sticks to his belief that "a talker who comes out in front of his show and looks like he slept in a bed instead of a beer joint the night before and not as if he had to tell a story to his audience will get more business than one of those recorded voices." Harry W. Hennies, owner of Hennies Bros.' Shows, is convinced that carnival grosses would drop with any wholesale invasion of the vocal robots. He believes firmly in the power of the talker to sell midway crowds. :He tells them about his attraction." say Hennies, "and the entire tip turns heads as he points down to the end banner. Then, walking to the other end of his platform, he swings attention to the other end banner-line. He commands attention in a way that no stereotyped record will ever achieve." Art B. Thomas reports that, while not yet using transcriptions on his own Art B. Thomas Shows, he believes, from observations made on other lots, that "they will be a blessing to the smaller operators who cannot afford to pay a good bally man." "The records are here for good," he says, "but they will never replace a good talker." Frank Bergen, general manager of the World of Mirth Shows, himself a former talker, scoffed at the idea of transcriptions ever replacing talkers, His answer was summed up with a quick: "What the hell?"